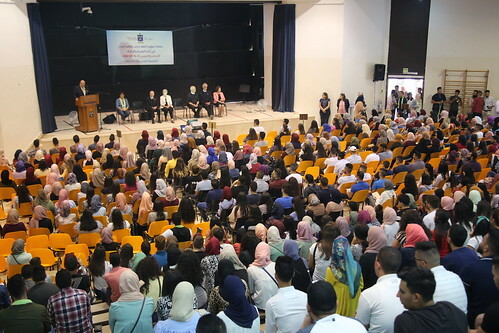 On Wednesday and Thursday, August 15th and 16th, Bethlehem University held its annual orientation for all new students. The auditorium was packed as the student body of Bethlehem University continues to increase. Around 1040 new students were accepted this academic year. Organized by the Dean of Students Office, Wednesday's event started with introducing the new students to the University administration. Ms. Mai Jaber, Assistant to the Dean of Students, welcomed the new students and thanked all those who helped in organizing the event. Brother Peter Bray, Vice Chancellor, congratulated the students for joining Bethlehem University and assured them that the University will provide them with a safe and predictable environment. During the second day, the new students were introduced to the different social programs available on campus. They also met with the Deans and faculty of their programs. Around 150 student counselors were also part of the team of the orientation to give the staff a hand and to share with students their own experiences at the University. The counselors gave the new students tours of campus and introduced them to the main facilities of the University.